In the last 10 years, Penang has become a highly liveable and progressive city. Although the connectivity and accessibility through public transportation is sufficient and efficient, it is time to keep improving, and for this, more roads, links, highways and LRT are essential. Crime has been reduced, due to the continuous effort in improving public safety; and there is now a clean, comfortable environment in Penang. Thus the primary concern is traffic congestion. The traffic congestion in Penang is mainly caused by economic growth and influx of tourists. The state has created a Transport Master Plan Strategy Report. The approach of this Master Plan is to adopt a balance between public transport and highway improvement. Needless to say, the announcement of this master plan has given Penang property development an optimistic outlook in the next decade. Right now Penang has a base point of 5% public transport mode share. And the government in Penang has established a target of 40% mode share for public transport and 60% for private vehicles. This is the same mode set by the federal government. Increasing public transport mode share is therefore the right incentives and stimuli to achieve a gradual shift. If we look at the number, in just 10 years, the number of vehicles has increased from 1.8 million to 2.7 million in 2017 in Penang. The report approaches a land swap model to construct three new highways in Penang Island and a third undersea tunnel project. Right now Penang has only one main spiral road, the Tun Dr Lim Chong Eu (LCE) Expressway that is congested at peak hours. Sadly due to traffic congestion, the economic growth is limited and there is a degradation of the environment. There is no question that the basic road network of the island need to improve to sustain the development of Penang and to meet the needs of the people. In this regard, many property developers are smart to act quick, announcing various Penang property new projects, including many Penang residential property that are close to these new transport development. 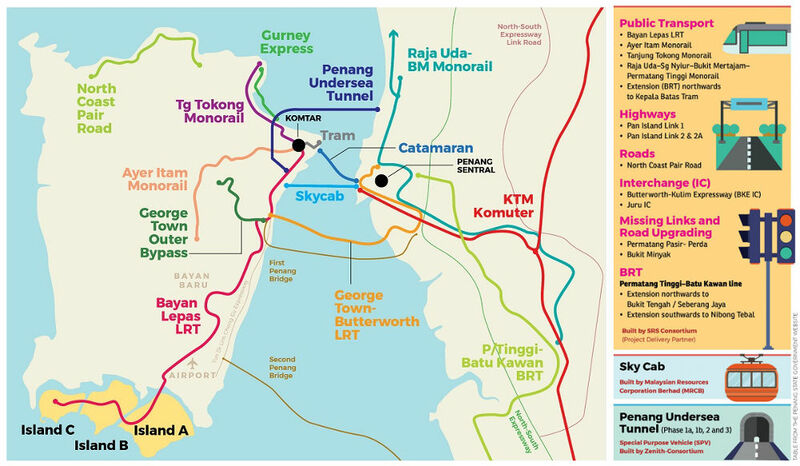 Another proposal to further increase connectivity between the island and the mainland is a cable car project connecting Penang Island with Penang Sentral. With this proposal, there will be a total of five links between Penang Island and the mainland. Certainly while provision for public transportation is needed especially during rush hours, Penang also needs highways like Pan-Island Link 1 (PIL 1), so traffic can be dispersed away from local roads. PIL1 will be a new spinal road linking the main residential corridors in the north and central region of the island to the industrial corridor in the south. The main backbone for public transport will be the Bayan Lepas LRT that will connect Georgetown to Penang International Airport. The proposed LRT line will cover Komtar, Macallum, Jelutong, LCC Terminal and Bayan Lepas FIZ. Penang will begin with the second phase with Air Itam to the Expressway first, by the first quarter of this year. The total completion for the three roads are scheduled to complete within the next six to nine years. This has spurred Penang property development, including the launch of several Penang property new projects, such as new housing development and commercial properties. Although there are still people who don't agree with this project, Penang needs to do something to solve the traffic congestion and achieve the goal of a more sustainable place. Essentially, the roads will reduce travelling time, and by doing this people, including the tourists will be more tempted to spend more time in Penang. This can translate to more tourists in Penang that will in turn bring more money to the state, because the transport development, for example, will reduce travelling time between Tanjung Bungah to the touristy belt of Batu Ferringhi, and allow people to travel from Gurney Drive to the Bayan Lepas International Airport within 20 minutes. In conclusion, thanks to the Transport Master Plan Strategy, Penang’s real estate value will revive as the master plan is highly comprehensive, and has covered many parts in the state, including Gurney Drive, Tanjung Bungah, Batu Ferringhi, Butterworth, Seberang Perai, Georgetown, Bayan Lepas FIZ, Airport, Paya Terubong, and more. In addition, as the plan spans over the next 11 years, the positive effect to the property in Penang will be gradual, steady and long.